The leadership at Bosch Hydraulics brought a challenging project to Industrial NetMedia. They had identified a need to have their full line of hydraulic hose products available online in all their seemingly infinite configurations. The company also wanted to feature a page that shared industry-specific documents for their site visitors to become knowledgable about the complexities of safe hydraulic connections and equipment. 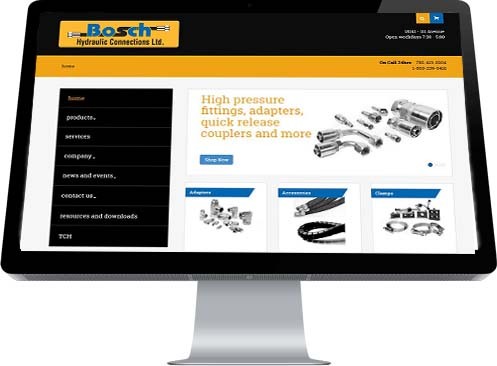 This page would not only be a great learning resource for pressurized liquid professionals, it would also help establish and maintain Bosch as the "go-to" dealer for all things hydraulic. Sharing the rich, twenty-year history of the firm was another goal set out by Bosch, as was hosting a page dedicated to the company's unique promotional initiatives. INM fullfilled the challenging list of requirements with a solid, full-function website, with all the features they wanted. to make their mark in their customer's web browsers.